I write horror stories, 137 to date, songs, about 200, many poems, and a screenplay. My you tube videos have accumulated over 2 million hits.I have written 180 blogs on my word press web site, Http://billywellshorror.com. I’ve seen more movies than anyone I personally know. I have collected over 15,000 comic books. I read constantly and have rated 400 books on Goodreads. My favorite authors are Stephen King, Preston & Child, John Sandford, Michael Connelly, Robert B. Parker , Clive Cussler, James Patterson, Jeffery Deaver, Dean Koontz, Edgar Allen Poe, Sir Arthur Conan Doyle, James Lee Burke, Richard Matheson, Lee Child, Jack Ketchum, and Jack Kilborn. In the third grade, I was captivated by adventure serials on TV. At the end of each cliffhanger episode, the hero faced certain death, but the next week, you found out how he escaped from a fall from a cliff or an exploding mine shaft. It was at that time, I started writing my own six-chapter adventure serials. Whenever I finished one, I let the little freckle-faced boy who sat in front of me read it. He liked my stories and, consequently, because he caused me to think I had a talent for writing, I have been writing ever since. I often wonder what would have happened if his critiques were unfavorable. As a teenager, I read a story entitled The October Game by Ray Bradbury in an Alfred Hitchcock anthology paperback. That story not only chilled me to the bone, but it inspired me to write horror stories of my own. I don’t outline since I write short stories so I must be seat of the pants. I did outline my 90 page screenplay, Most of my short stories were written long hand on a yellow pad in my golf cart, dictated into the Dragon dictation program, and uploaded into Word rather than written on my desktop computer as I once did. This new process has yielded more detailed and intricate plots. Unfortunately, the subsequent editing process is still as maddening and time consuming as ever. After I finish the first draft, I listen to the story read back to me while I edit the hard copy. Afterward I submit the hard copy to a weekly writing class, then I read it aloud, and receive feedback verbally and on the hard copies, which I use or not use as I see fit. 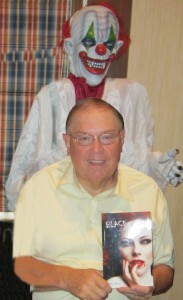 I write fiction, but I don’t talk to my characters since many are monsters or psychopaths. Write because you love it, not to get rich. Read a lot. If you attend writing classes , don’t let the those critiquing beat you down. The majority may know less than you do and may never have published anything to justify their opinion. Take what you like and leave the rest behind. A budding writer needs encouragement and legitimate support along with the criticism. If you don’t get it, find another writing group. Traditional publishers are getting fewer and fewer. For a new writer to sign with one is extremely hard and time consuming unless you have exceptional ability and savvy. The good news is self publishing has become a viable and profitable alternative and it gives you complete control of your book. Try both and see what happens. Something has changed over the last six months which has decreased my personal book sales. I understand there is an incredible number of books being added to Amazon each month. I assume since anyone can self publish a book and have every word misspelled, the quality of the writing will continue to diminish. However, there will always be great successes like The Da Vinci Code, The Hunger Games, and Fifty Shades of Grey, etc and many more failures under the radar. Write because you love it and continue to try to better your craft. Maybe you will rise to the top and be the next Stephen King.